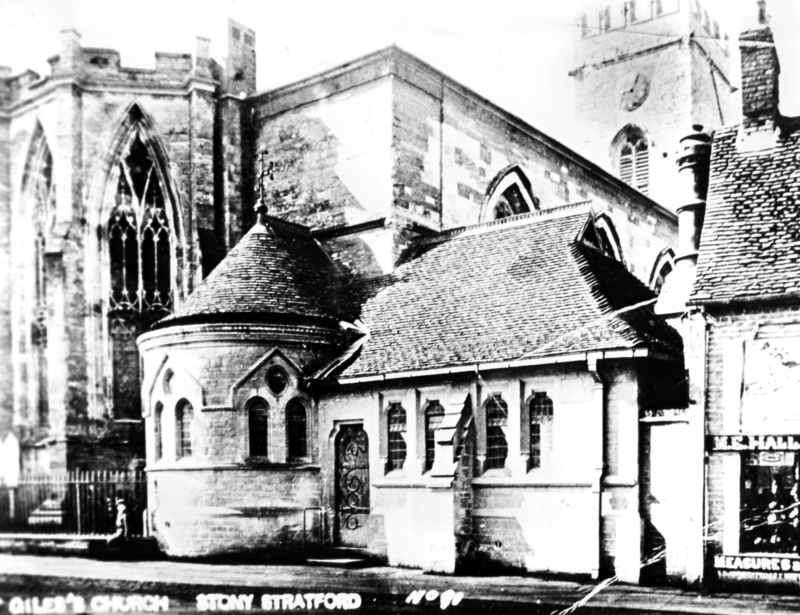 When the people of Stony Stratford looked out on the Feast of Stephen in 1964 they saw smoke coming from the church of St Giles. Four small children had started a fire that completely destroyed the organ and left the woodwork charred and the paintwork scorched. One of the stained glass windows had melted in the heat and, but for the prompt action of the fire brigade, the whole church would have been burnt to the ground. History was repeating itself, for in 1742 a similar sad group of Stony Stratford people stood looking at the charred remains of their church of St Mary Magdalene. A maidservant in the kitchen of the Bull Inn set fire to a sheet. The fire quickly spread, destroying 146 houses and the ancient church on the east side of the High Street. Only the perpendicular tower remained standing among the rubble. As the other church in the town was the half ruinous St Giles on the west side of the street, the decision was taken that the church of St Giles should be repaired and enlarged, and that this would be the parish church for both “sides” of Stony Stratford. Thus, as a result of the tragedy of the great Stony Stratford fire, the quarrelling and bickering that had gone on for many centuries between the two “sides”, especially over the upkeep of the road which ran between them, came to an end. Work on the rebuilt church was completed in 1776 by the architect Francis Iron and in the spacious interior can be seen the fluted slender pillars that soar up to intertwine and form the graceful fan-vaulting of the roof. 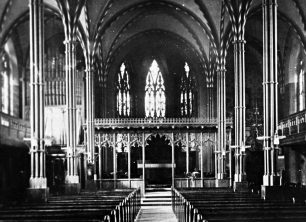 In 1905 the church of St Giles was “restored” according to the Victorian fashion, attempting to make the interior look like a medieval church. 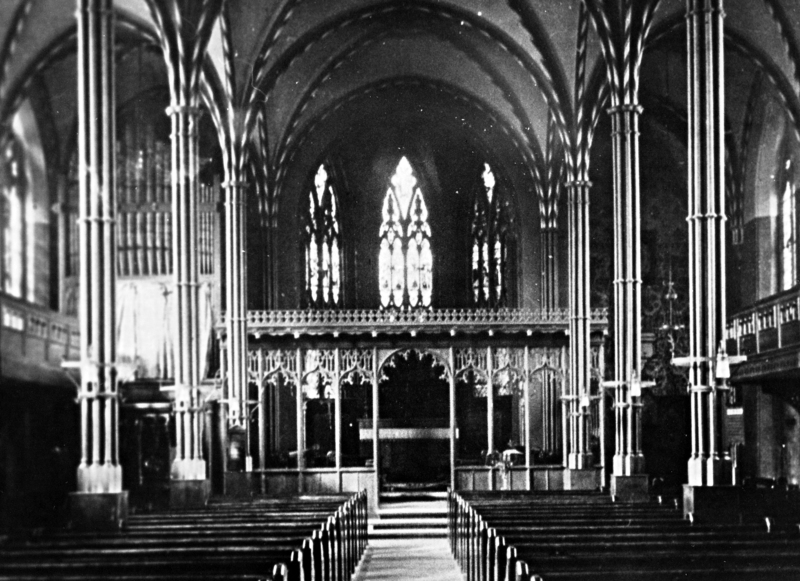 The result was that the lovely spacious feeling was cluttered up with a heavily carved chancel screen, and the addition of choir stalls and a Lady Chapel destroyed the Georgian simplicity.The fire of 1964 and the resulting damage seemed to some people to be a God-given opportunity for restoring the church to its original Georgian simplicity. The happy result can be seen around you today in the church of St Mary and St Giles that was dedicated and re-hallowed by the Bishop of Buckingham on April 7th 1968.